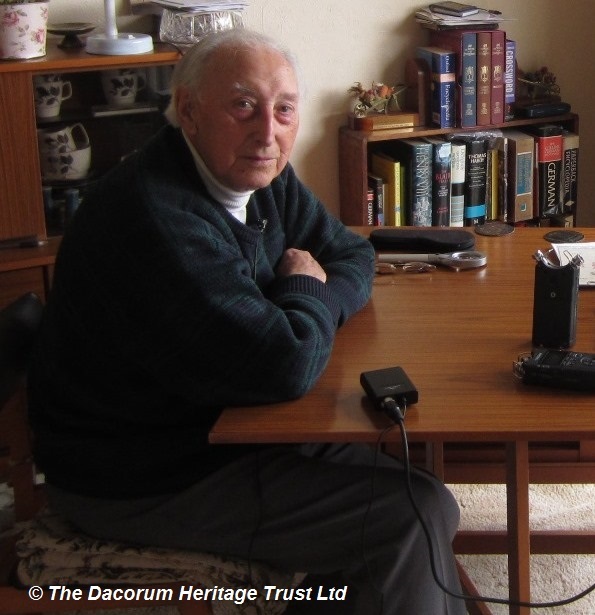 Saving the 70s- Les Taber | The Dacorum Heritage Trust Ltd.
We interviewed Mr Les Taber in the summer of 2014. At the beginning of the 1970s Les started as Councillor for Adeyfield and in this interview he tells us what changes happened throughout this decade. Here are a few clips, which we hope spark some of your own memories. Building of the Magic Roundabout Transcript: May 1970 and I was elected in the Adeyfield ward which was at that time consisted of what is Adeyfield East and Adeyfield West that was a three councillor ward and as I say I went on for the first time when I was working at Lucas Aerospace at the time. It was something I’d always wanted to do. I had been representing workers at Lucas and going on the Council was just a step in the same direction representing people. I’d enjoyed it at that time unlike the councillors of today we weren’t paid any money as everything was voluntary, it was enjoyable. After one year on the Council I was elected by my fellow councillors as Chairman of the works committee at that time, and as that I was part of the team that installed what is called the Magic Roundabout which the real name is Plough Roundabout based on the name of a local pub there which was a large pub at the site. And that was interesting. I went to study another roundabout of the same kind, and then we came back to Hemel and the start of that was first of all we decided it would be temporary because we didn’t know how successful it would be. Forgetting all the things that led up to it with decisions and committees etc. it came the day when we were going to put the roundabout in and what we did before 8am in the morning we had put dummy roundabouts in which now there are proper roundabouts at each junction, but we made little islands of tyres and we left it at that and the traffic was held up I think at 7.30 in the morning with the traffic approaching these five entries and exits and then the police then released them to let the drivers sort themselves out. And they did quite reasonably although obviously some people became distressed. I remember going down in the evening of it being in operation and I saw a driver approach it and then he couldn’t get round it quick enough and he went the conventional way round, he didn’t use it treating the islands as mini roundabouts, he just went round it and we left there. We went back home and at the time there was an off licence just off the dual carriageway, you may remember it, and I went in there and I bought something and as I came out a man was getting out of his car and he said “when I find the so and so who put that roundabout in”, so I got in my car and drove off. Then I was asked by John Hooper a councillor who was a district Chairman at the time, whether we should continue with it and I said yes, let’s go ahead and actually it has proved quite a success I’m quite pleased about that, it was not that I could take the credit of it, except that I was involved at the birth of what is now known as the Magic Roundabout which has distinguished Hemel Hempstead and quite honestly throughout the world because even I was asked questions about it in Australia. That was the interesting thing. Transcript: Another thing was being on the Council it occurred to me when we were just started that as the Chairman of the works committee I was responsible for refuse collection etc. and I went to Clarence Road and there they kept the refuse vehicles for collecting rural and Berkhamsted refuse and the refuse collectors or as they were called in those days dustbin men, they had what is euphemistically called a rest room and it was furnished with all stuff they had rescued from the tip and they had old sofas in it and primitive cooking and heating, and of course as being a trade unionist this didn’t seem the right kind of equipment with surroundings people would be eating their meals in etc. and so I insisted that it should be refurnished with proper eating furniture and it was cleaned and tidied up. I don’t know whether it was popular with the dustbin men or not. Transcript: There was of course a big upheaval of local authorities when Mrs. Thatcher was in charge and the idea was that all the local Councils would amalgamate into large Councils on the basis that instead of duplicated services there would be one service and this resulted in Hemel Hempstead becoming the core of the satellite areas around so a new Council was born which was called The Dacorum District Council because I had never heard of the word Dacorum before in all my life It meant that then we had councillors from Berkhamsted, Chipperfield, Markyate all attending the meetings at the Civic Centre which had been built by Hemel Hempstead, the old Hemel Hempstead Borough Council, as indeed the Pavilion had, it was a time when Councils did things and got them right, if I may make that point, , so in 1973 it was a waiting period until we moved into 1974 when the election took place with this new District Council. That was won by Labour who held it until 1976 and in 1976 the Conservatives took control, they abolished then the trial pedestrianisation of Marlowes they had started a trial of that and no one will remember it but it did take place before that. 1977 Silver Jubilee Transcript: We had street parties at the time and we had a street party here. That’s right I dressed up as a sailor in a white sailor suit and got the kids doing silly things and it was quite enjoyable with the kids at that time. Town Twinning Transcript: In the 70s we brought in the twinning with Neu-Isenburg and that was an interesting period where we had German visitors to this house. Well, at that time twinning was a popular thing with local authorities and they were twinning Watford I think was twinned with about four or five towns. At that time our first Chairman of the District Council was Jack Johnson former headmaster of Bennetts End School and he was keen on that to make contact with Neu-Isenburg. we then had visits from Neu-Isenburg people and we had a return visit and deeds were exchanged or letters of approval were exchanged between the two authorities. I think in the Council Chamber there are replicas or the actual copies of early agreements when we were twinned with our German counterpart and quite an interesting visit to Neu-Isenburg first visit. One of the things that we had, we contacted a theatre group and they constructed a street theatre in the shape of an enlarged Punch and Judy show and they even had a background of a train passing through, and it was all based on a Little Nell story and it was set up in the square in Neu-Isenburg and people loved looking at that. They enjoyed that. It was a nice move and of course we only twinned with one town and that has remained and I think it can be expensive and these days you can’t load it on the council tax. It was positive because we had been through a war with Germany and we would move into Europe and there needed to be a revaluation of our attitude to Germany and my wife lost a brother during the war, who was in the Air Force, and as result of that people had mixed feelings about Germans but we had Germans stay here several times and it enabled people to start looking beyond the shores of England so that was a positive thing.